This luxurious tented lodge sits on a deserted beach on the edge of Yala National Park. 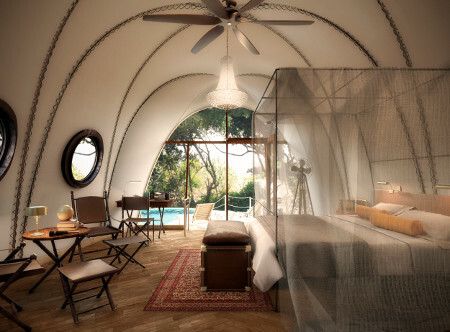 The vaulted 'cocoon' tents combine the comfort of a luxury hotel with the excitement of a safari-style wilderness experience and are dotted around five watering holes designed to attract a variety of birdlife and amphibians. A bamboo-clad bar and restaurant serve creative daily changing menus, while the lodge boasts a Sanctuary Spa and a large free-form infinity pool. In cocoon suites with four poster king bed, ceiling fan, copper bath, mini bar and outdoor viewing deck overlooking a watering hole and facing the beach. Cocoon pool suites which offer a private plunge pool * family cocoon suite with adjoining urchin tent, which accommodate two adults and two children (2-12 years) or three adults. 5-5½ hours from Colombo airport. Up to 25% suite discount: On selected dates between May-Sep & Nov-Dec 19.